Ring by spring! Planning a spring wedding in Half Moon Bay? Pretty pastels, sky-high cakes, bold brows and gold foil paper – know how to make them yours. See spring wedding colors, dresses, flowers and venue and more with these ideas. The Spring 2017 bridal runways were full of major wedding dress inspiration! Check their designs at www.brides.com. These sugar masterpieces are as elegant as ever with bold sugar flowers, detailed patterns and pretty piping. A wedding cake is like the exclamation point to your day, so why not go big and tall? Embrace this blooming season in full force. Green garlands of ivy, lemon leaves or seeded eucalyptus will add a fresh look to long feasting tables or aisles. Or opt for flowering branches, like cherry blossoms or forsythia—they’ll add height to your reception tables and make for easy conversation. Gold foil reigns! The foil trend—gold, rose gold, sliver and copper—is here to stay. From light dustings to full-on gold rushes, this luxe printing technique can add a fancy touch to an otherwise casual invitation. The Hastings House Garden – lovely private outdoor setting, on the edge of the Pacific Ocean. Half Moon Bay Golf Links – With its unparalleled bluff-top Pacific views and luxurious amenities, Half Moon Bay Golf Links is the ultimate wedding ceremony location. Long Branch Half Moon Bay Wedding Site – Long Branch Farms provides the perfect setting for a memorable wedding. This old west town, located in Half Moon Bay, has everything you’ll need for your wedding. 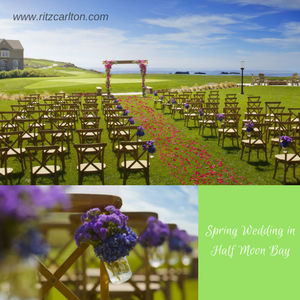 The Ritz-Carlton, Half Moon Bay – Sweeping ocean views, an exclusive coastal setting and inviting décor are only the beginning of what make our resort the ideal venue for your destination wedding in Half Moon Bay. Whether the wedding is in your hometown or far away, it is important to manage your family and guests accommodation to ensure their comfort. Harbor View Inn offers comfortable single king, single queen and double queen rooms as well as a newly remodeled single king and single queen rooms in order to accommodate your needs. It is located in 51 Ave Alhambra Half Moon Bay, CA 94019.